By all accounts, Sony Pictures Animation’s live-action/CG hybrid take on Beatrix Potter’s classic characters should have been destined to die a quick death. After all, this being Sony (which cannot market a film, regardless of its quality, to save its own life), the trailers made it out to look like the biggest slap in the face to the author’s timeless legacy, and led many people to believe that this was going to be yet another dismal failure in the studio’s underwhelming history. Yet when it first debuted in the States, reviews were much kinder than expected; not praising it as a Paddington-style masterpiece or anything, but with many of them declaring it to be far superior to what it was shown to be in the advertising. I can safely say that this is indeed accurate to Peter Rabbit, which although isn’t perfect is a lot funnier, cleverer and more entertaining than it has any right to be. In this version of the story, Peter Rabbit (an entirely CG creation voiced by James Corden) is constantly trying to get into the vegetable-filled garden of cantankerous old Mr. McGregor (Sam Neill), with the help of his triplet sisters Flopsy (Margot Robbit), Mopsy (Elizabeth Debicki) and Cotton-Tail (Daisy Ridley), and his cousin Benjamin Bunny (Colin Moody). When Mr. McGregor suddenly dies, Peter and his friends rejoice in their newfound ownership of the garden – which is short-lived when his tempestuous nephew Thomas (Domhnall Gleeson) shows up to sell the house for financial gain. This kicks off a turf war between Peter and Thomas, especially as they fight for the affections of next-door artist and animal lover Bea (Rose Byrne). Like most children, I grew up reading the stories of Peter Rabbit and his many animal friends, and have fond memories of those books as well as the animated anthology series broadcast on the BBC back in the day. Even so, I found myself not too mad at the film’s decision to modernise the story with much more comedy and slapstick, because while this isn’t the most straightforward adaptation of Beatrix Potter’s work, it exists as its own thing while not veering too far away from the source material. As it turns out, it also happens to be a fun and often very funny movie that’s filled with delightful quips and moments of pure cartoon zaniness, which call back to the classic Looney Tunes cartoons and even the irreverent and intelligent humour of Animaniacs. Nonetheless, it still contains a fair amount of heart to it, and you can see that the people behind this movie really do have the utmost respect for the source material – especially the artwork, which is lovingly paid homage to during some sequences in this movie – but just happened to go a different direction with the film. 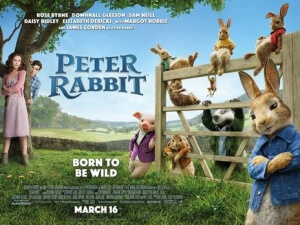 The rabbits are plenty of fun, from Corden’s boisterous and cocky Peter to the triplets, who each have distinct and identifiable personalities outside of just the one trait, and are allowed to be funny as well as willing participants in the slapstick (although Ridley’s Cotton-Tail gets some of the bigger laughs out of the three). The CGI used on them is surprisingly really strong; the photo-realistic graphics makes them look and move like actual rabbits, enhancing their fur and adorable faces to blend in nicely to the live-action environments, and opposite their human co-stars who equally have great qualities to them. Gleeson and Byrne has really sweet chemistry together, and you can buy how these two would end up liking each other despite their radically different personalities; Gleeson, in particular, is having the time of his life as the comic foil who gets to be hilarious and over-the-top in all the right ways, but even better he’s not playing a two-dimensional bad guy either as the film allows us to see him when he’s not so menacing, showing that he can be a decent person when he doesn’t let his severe insecurities get in the way. While I was enjoying this film a fair bit, laughing at all the right moments and being entertained by the cartoonish tone that the film unapologetically adopts for itself, there were parts of it where I could certainly understand why people would not care as much for it. Take, for instance, the now-infamous allergy scene which even caused Sony to issue an apology after numerous complaints; in context, the scene is probably the cruellest that the film gets, and it’s questionable as to why the filmmakers decided to leave it in at all given how serious allergic reactions to things can be, but again it’s not like everything else about the film was just as degrading and ill-conceived, so I just regarded it as one of the very few missteps the film opted to take. However, I can sympathise why anyone would be hesitant to see it because there are other parts which can tend to irritate people, particularly the non-stop humour which tends to wear you out after a while; I wasn’t fazed by any of it, but anyone that is can be completely understood as to why. Again, for a film that could have turned out to be pretty reprehensible, especially in light of the source material it is adapting, the fact that it turned out to be as enjoyable as it was is truly a shocker. It’s not the most accurate Beatrix Potter adaptation in the world, but as a straightforward family comedy, it delivers all the nutritious goods to open-minded audiences everywhere. Peter Rabbit is a fun and entertaining family comedy which, despite not being the most accurate adaptation of Beatrix Potter’s series of books, goes all out in its effective and often hilarious moments of comedy and slapstick, coupled with a sweet and genuine heart that is sure to win over audiences who may be put off by the film’s underwhelming advertising.